Free Shipping Included! 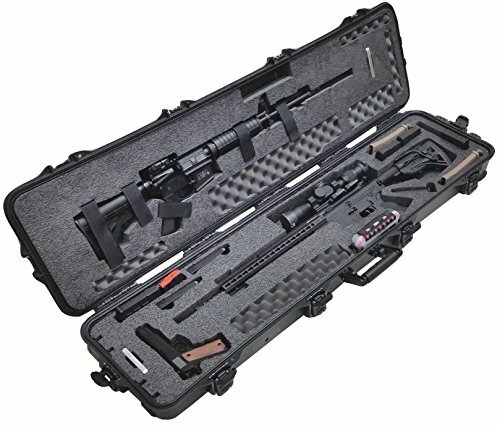 Case Club Pre-Made Waterproof 2 AR Rifle Case with Silica Gel & Accessory Box by Case Club at Practical Tactical Podcast. MPN: ASSYCC108187PL2AR. Hurry! Limited time offer. Offer valid only while supplies last. The Case Club 2 AR Rifle Case is 2nd to none in terms of quality, convenience, and affordability. In short, it is the best 2 AR Case on the market. The Case Club 2 AR Rifle Case is 2nd to none in terms of quality, convenience, and affordability. In short, it is the best 2 AR Case on the market. The precut foam will fit up to two AR15 or AR10 rifles with up to 20" barrels, as well as their optics. The base also holds a full size pistol and extra rifle & pistol magazine. The lid also includes a small waterproof accessory box. Velcro straps ensure the lid rifle does not move around while the case is in transit. The case comes with 2 silica gel canisters to help keep contents dry. Once the silica gel is saturated just pop it in the oven to cook out the moisture & use it again. The case itself is weatherproof, dustproof, & has a built in pressure equalization valve for changing altitudes. It is heavy duty enough to ship or check on an airplane and can handle the abuse from TSA agents. Five built in heavy duty latches ensure nothing gets in or out. Two latches are even keyed for extra security (set of keys included). Padlockable holes are built right into the case, and can take standard sized padlocks so you can be guaranteed this case is safe & secure. The foam insert is closed cell military grade polyethylene which can be wiped clean if wet or oily. The foam is perforated above and below all of the firearm cutouts so you can remove the foam (with included knife) as needed to customize the insert for your unique optics and attachments. This case is compact, organized, uses all available space to the fullest, and won't break the bank.Exterior dimensions are 55"L x 16"W x 6"D. Protect your investment, buy Case Club. Also holds extra magazines, optics, gun attachments, & various accessories. Does not accommodate side attachments. If you have any questions about this product by Case Club, contact us by completing and submitting the form below. If you are looking for a specif part number, please include it with your message.